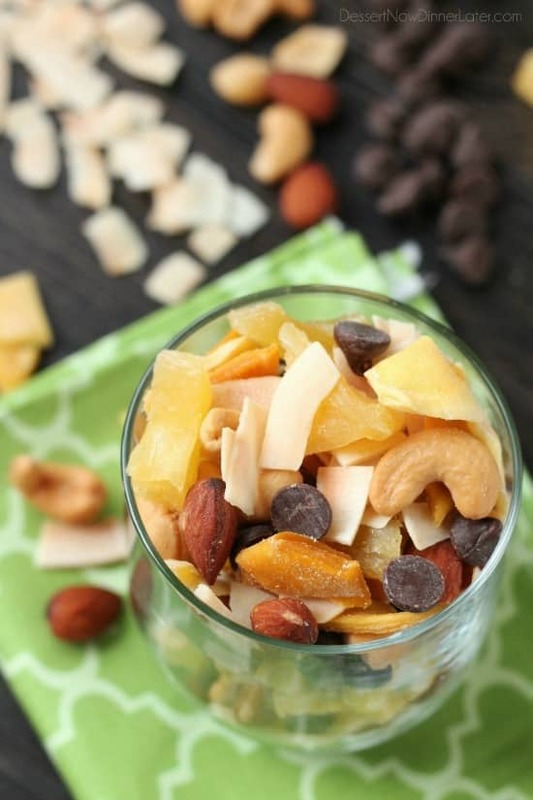 Tropical Trail Mix | Dessert Now, Dinner Later! 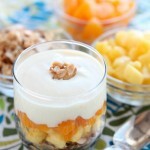 **This is a sponsored post written by me on behalf of Sunsweet Growers. All opinions are 100% mine. 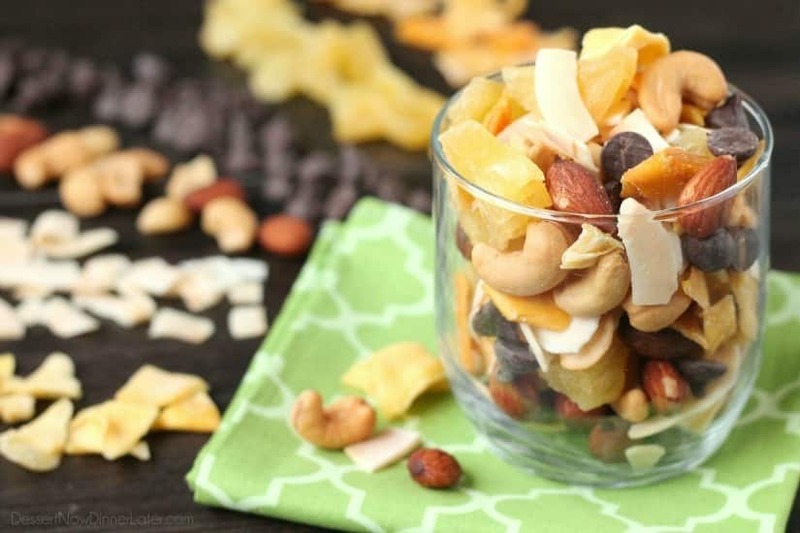 This Tropical Trail Mix is salty, sweet, and full of Sunsweet tropical flavors! A great on-the-go snack! It’s still crazy cold and snowy here in Utah, and I am just dreaming of summer, and sun, and all things hot! And since I’m stuck here until the snow melts, probably in May, I’m going to just munch on some of this tropical trail mix and pretend I’m on a tropical getaway with my taste buds. The best part about this trail mix is the Sunsweet Philippine Tropicals fruits. Sourced from unique climates with ideal growing conditions, these fruits are succulent and sweet! 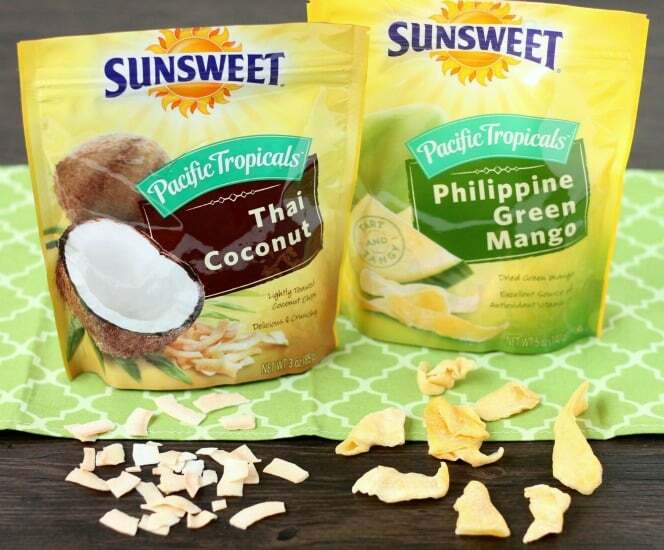 The two newest flavors, Thai Coconut and Philippine Green Mango are a real treat! The Thai Coconut Chip is probably my favorite. They are crunchy and just the right amount of sweet, with a hint of vanilla. I literally can’t stop munching on them. So good! The Philippine Green Mango is a close second for me. They are sweet, but have this tang to them because they are picked early, just as they are beginning to ripen. Delicious! The other two Pacific Tropicals included in my trail mix are the most delicious Philippine Mango and Philippine Pineapple. 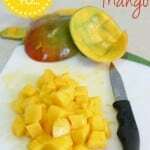 I can’t even begin to tell you about how amazingly thick, soft, and sweet the Philippine Mango is! The mangoes are found in a less traveled island of the Philippines, Marabella, and even the locals rave about them. This is my husband’s favorite of the 4 Pacific Tropicals. 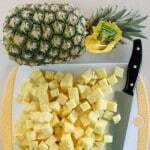 And last but not least is the Philippine Pineapple, which are perfectly large chunks of delicious dried pineapple. 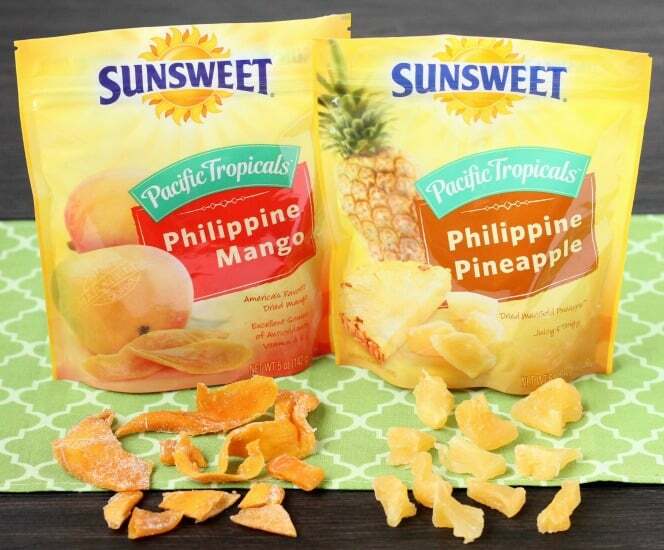 The quality of these Sunsweet dried fruits really make this Tropical Trail Mix over-the-top delicious. All I had to do was cut up the fruits into smaller pieces, add some nuts (macadamias, almonds, cashews), and semi-sweet chocolate chips, because I love a little chocolate with my fruit and nuts. Voila! Snack mix ready to go! 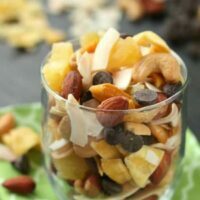 I’m telling you, a handful of this Tropical Trail Mix will satisfy your taste buds and make you feel like you are on a tropical island, but why dream about if if you can make it a reality? Sunsweet is hosting a Tropical Vacation Getaway!!! That’s right! If you’re a Sunsweet fan like I am, and you win, you can actually pick your domestic Tropical vacation! To enter, all you do is pick between Hawaii, Florida, or a Cruise!!! Plus, there are additional opportunities for weekly winners to receive a gift basket containing the new Tropicals flavors and beach gear. What’s your dream tropical vacation? Go enter the Sunsweet Find Your Paradise Sweepstakes and come back to tell me what you picked! 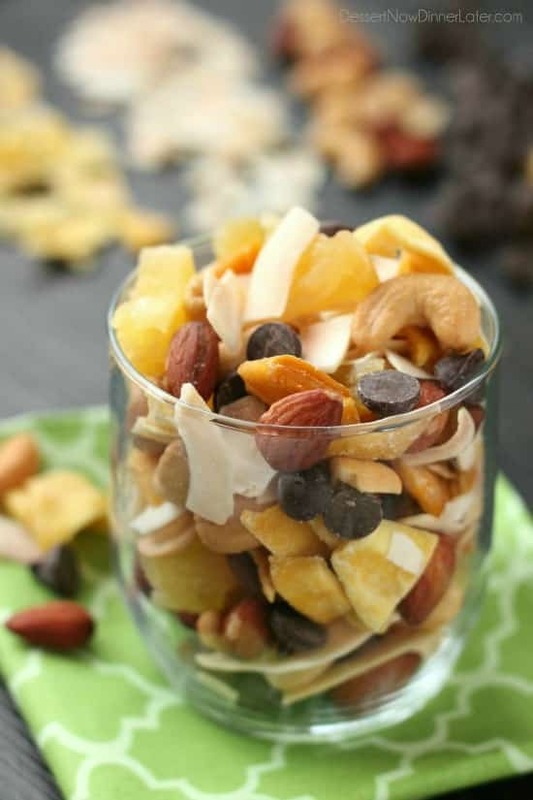 May the odds be ever in your favor, and in the meantime, whip up this delicious Tropical Trail Mix to snack on! 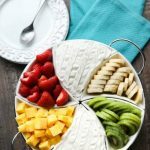 Using scissors or a knife and cutting board, cut up the Sunsweet Pacific Tropicals Mangoes and Pineapple into smaller, pieces to mimic the size of the Thai Coconut Chips and mixed nuts. Add the mixed nuts and chocolate chips. Toss to mix the fruit, nuts, and chocolate chips evenly. Scoop ¼ cup servings into snack size bags for a delicious snack on-the-go. I picked Florida! Love Florida sunshine. Hawaii, Hawaii, Hawaii!!! I have always wanted to go to Hawaii and enjoy the food and see volcanoes!!! I would love to win this trip and enjoy some sun!!! Hawaii!! I’ve only been there on a layover, and I would love to actually get outside the airport! A cruise but I love Hawaii. I Chose Hawaii! And, where in Utah can you get SunSweet? Hey Val! You can find Sunsweet Mango (and prunes) at Walmart for sure. I haven’t checked other stores though. I had all of these products shipped to me for this post. I hope I can find them again. If I see them anywhere else I will let you know! Can’t find them here in NOLA. Couldn’t locate them on Amazon, either. Where did you have them shipped from? I’m asking my contact to see if she can provide me with more information. If I hear of a store locator tool, I will let you know! We love having trail mix like this around to snack on! Love the tropical flavors during these gray, dreary days! We are trail mix junkies. We really loved this one! Thanks Jessica!